I'm back, in the nick of time, with one last side dish to grace your Thanksgiving table (because really, can you ever have enough sides?) By now, you're probably squared away with your stuffing, your Turkey, and those pies. So here's an idea for what to do with all those sweet potatoes. I wouldn't call it a traditional dish, but it's certainly a play on tradition. I've always loved twice-baked potatoes, with their crisp skin and just enough potato inside to cushion the cheesy filling. So why not twice-bake sweet potatoes? Yes, their flesh is less starchy, and their skins are harder to crisp up. But when you succeed -- and you will succeed - you will reap the rewards of hot, sweet, crunchy, soft, sweet 'taters like you've never had'em before. Here's the beauty of this dish. Have a favorite filling for twice-baked potatoes? It'll go great here, too. I'm talking sour cream and cheddar and chives, or parmesan and sage, or whatever you usually use. But you could also take these in a totally different direction, as I did last night. Instead of trying to balance the sweet flesh with a more savory filling, I succumbed to the sweetness. Boy did I ever. Here's what we're doing: we're filling 'tater halves with a mix of sour cream, maple syrup, and crunchy demerara sugar. When I made them, I simply mixed the ingredients together - but I'm recommending that you sprinkle the sugar over everything else. That way you'll have a crunchy, burnt-sugary gratinee topping. You'll know they're done when you've had to fight yourself at least 3 times from opening that oven, pulling out the sweet potatoes, and eating every last one, right then and there. Now that's what I call a successful Thanksgiving side. Preheat the oven to 400 degrees F. Line the bottom of the oven with foil. 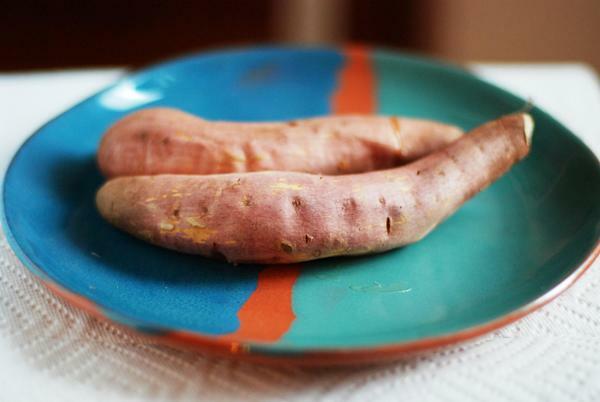 Prick sweet potatoes in several places, and set on a rack in the middle of the oven for about 35-40 minutes, until they do not resist when pricked with a knife. Halve sweet potatoes lengthwise, and use a spoon to scoop out most of the flesh, leaving a 1/4-lining of flesh on each of the skins. Transfer skins to a lined baking sheet. Spoon the sour cream mixture evenly into each of the skins, and top with a generous sprinkling of demerara sugar and the tiniest pinch of flaky salt. Return to the oven, and bake about 20 minutes more, until skins are crisp at the edges and sour cream mixture is bubbling. Serve hot.